The BFI continues its Gothic season with three new collections from the BBC archives. There is nothing better as the Christmas season approaches than to settle down with a good tale of terror and these volumes, including the 1970s series Dead of Night, horror anthology Supernatural and M.R. 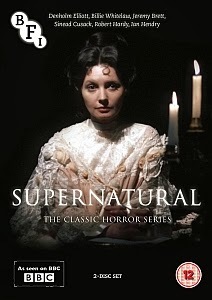 James collection Classic Ghost Stories from the 1980s, make ideal entertainment for the long winter nights. Featuring such stalwarts of British drama as Denholm Elliott, Clive Swift and Billie Whitelaw, these stories are infused with a sense of timelessness, making them as uneasy to view now as they were when first aired. Period chillers played out against an obvious studio backdrop may seem passé to today’s audiences. However, the sense of a local amateur dramatic society production which permeates the various stories, simply adds to their charm, in many cases heightening the disquiet they instil within audiences. Originally consisting of eight episodes, Dead of Night was broadcast during November and December 1972. The three stories included here – ‘A Woman Sobbing’, ‘The Exorcism’ and ‘Return Flight’ – are all that remain, but it’s understandable why they are so fondly remembered. The Anna Massey-starring ‘A Woman Sobbing’ highlights the magic of these short films which contemporised age-old fears to startling effect. Taking a more measured approach is anthology offering, Supernatural. Eschewing the obvious temptation to use elaborate effects or gory visuals, stories such as ‘The Werewolf Reunion’ involving lycanthropy in a remote area of Eastern Europe, succeed by inference and suggestion. Cleverly introduced by the common thread of a Victorian gentlemen’s group called ‘The Club of the Dead’, whose members meet to relate horrifying tales and ghostly experiences, the dramatisations which ensue allow such distinguished thespians as Ian Hendry and Leslie-Anne Down to actually act – an opportunity not always available to the cast members of television productions. Finally, Classic Ghost Stories consisted of several well known, as well as some more obscure tales, from the pen of the master of Victorian menace, M.R. James. The manner in which they were brought alive, told by Robert Powell and Michael Bryant, who simply sat by a fireside or in a dimly lit room and relayed the stories in much the same way as James did to his friends and students at Cambridge, was as disturbingly effective as any straightforward dramatic re-enactment. As a result they perfectly compliment the BFI’s growing library of gothic classics, to which these new BBC rereleases make a welcome addition.